Believe it or not, I hadn’t had these before. A special thank you to the lovely Katie for introducing me. They were much better than I thought! Not too much dough, just enough Oreo. Definitely a dish to share, I had one of five and that was plenty. Sort of like the deep fried buckeyes from last year. I always associated this place with beer. 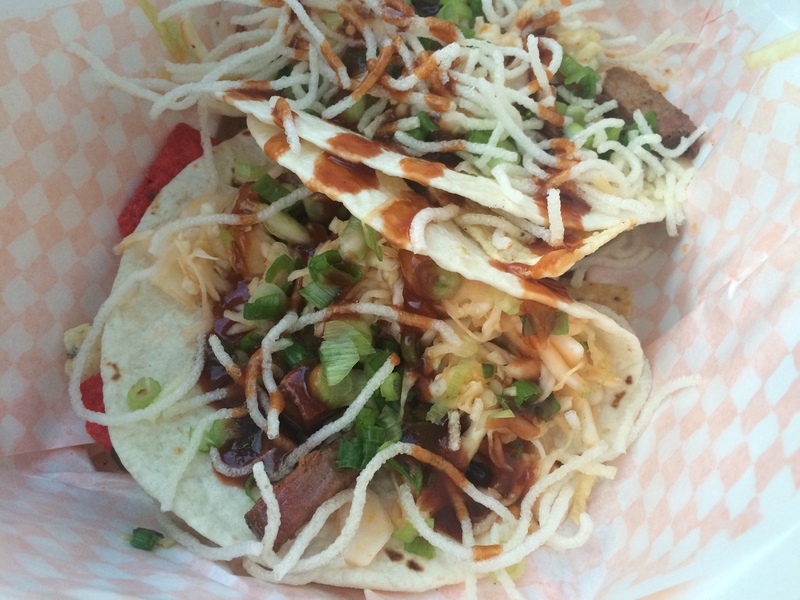 I didn’t realize they did food until I heard about these tacos and wanted to give them a try. Shanghaied Henri’s is located just outside the International Bazaar, and these tacos are great if you’re looking for a tasty option that won’t kill your stomach or your wallet. It’s like eating “real food” at the fair. They were slightly spicy, but it was more heat than hot if that helps you get a sense for it. I would eat these again if I was in a full meal type of mood. I have no idea how this new food missed me. Thank God for Instagram, or I wouldn’t have known this existed! 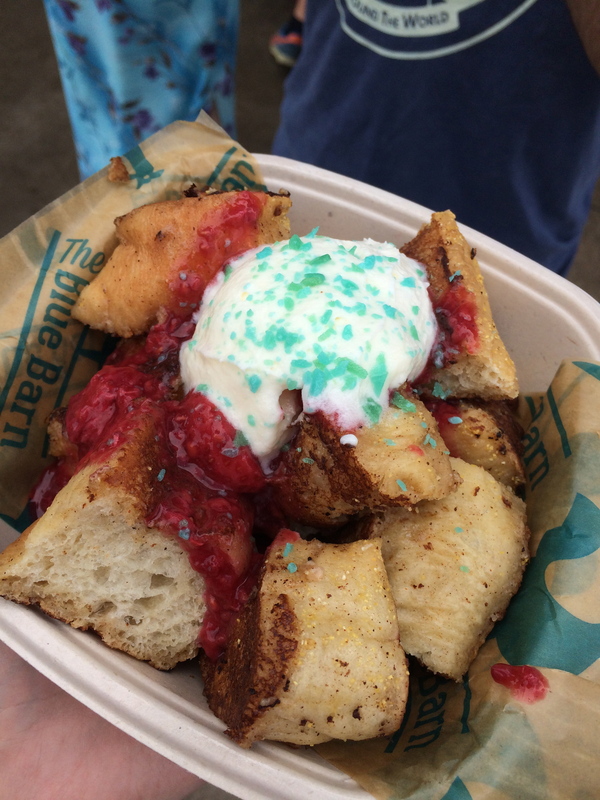 It’s french toast pieces with berry sauce, whipped cream, and pop rocks. The french toast was really good. Big fluffy, golden brown pieces of french toast topped with a very fresh berry sauce and whipped cream. The one thing I wanted more of was the pop rock sensation. I got a couple bites where you could feel them, and it was so fun, but I think once they hit the whipped cream they lose some of their fizzle. But if I’m having breakfast at the fair, this would be what I’d get. Modeled here by the ever lovely Michael, this Snicker’s salad was just ok. Maybe I just don’t understand what it’s supposed to be, or I had high expectations for a flavor explosion (literally) after the pop rocks french toast. Maybe it’s really good Snicker’s salad as far as they go, but it just tasted like pudding with candy and apples in it. Which isn’t a bad thing, just not as flavor-ka-pow as I hoped. I did not even know this was a thing. Apparently you can make root beer our of birch bark. Insanity. It tastes just like root beer until you get to the aftertaste, then it’s minty. So strange, but very good and very refreshing. Check them out in the food building next year if you’re feeling something different than your average bear. I was lucky enough to be at the fair while The Rabbit Hole was featured at the Midtown Global Market booth. 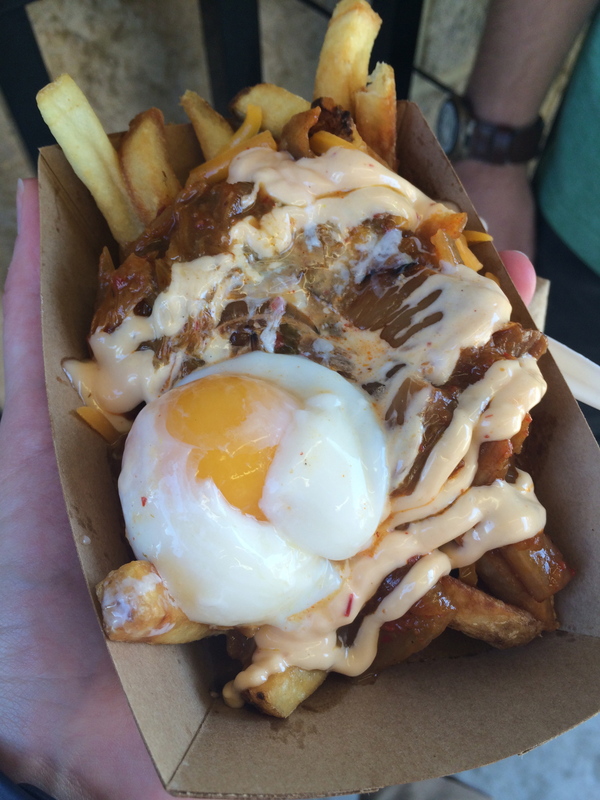 This Kimchi ‘n’ Curry Poutine was awesome. It looks like it will be weird and gross, but all the flavors work together; it’s very well balanced. I didn’t think there was a whole lot of meat in mine, but maybe it was just in small pieces, and I didn’t notice because I was gobbling it down so quickly. Even the most hesitant of taste testers were swayed by this tasty poutine. Great stuff! And that’s it! It doesn’t seem like a lot this year, but based on pounds gained, it was plenty. 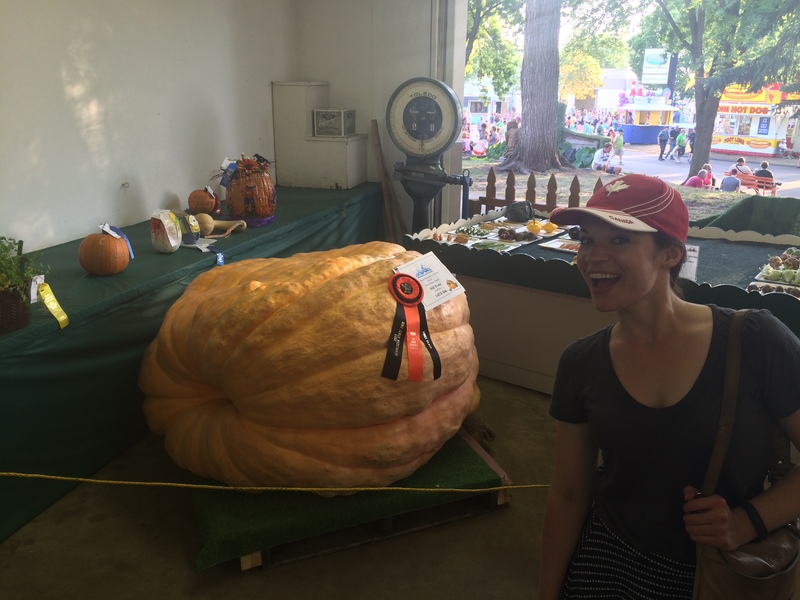 And speaking of weight…did you guess whether the pig or the pumpkin was heavier this year? It was….the pumpkin! Clocking over 1400 pounds, the pumpkin outweighed Captain Jack’s 1,080 pounds by nearly 400 pounds. Incredible. 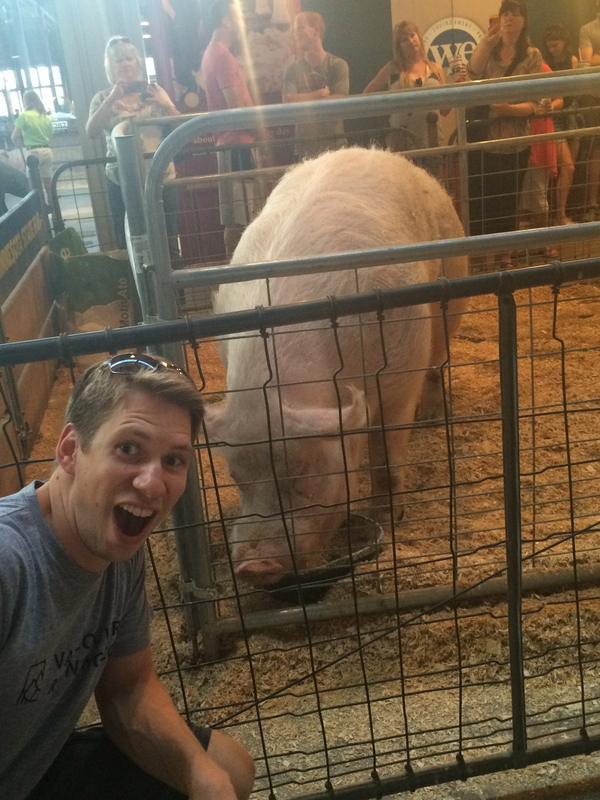 Leave me a comment and let me know what you ate at the fair! What should I put on my list for next year? 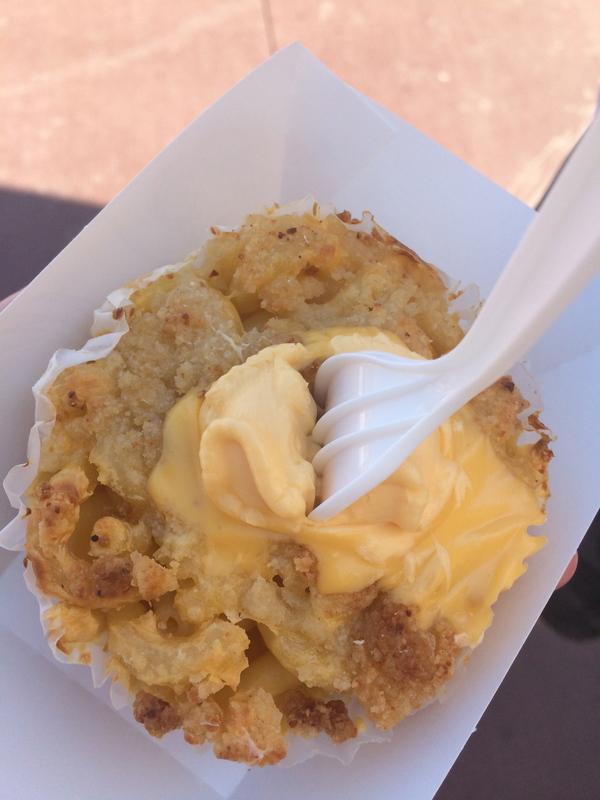 This entry was posted in Uncategorized and tagged crazy state fair food, deep fried oreos, kimchi n curry poutine, mac n cheese cupcake, Minnesota State Fair, State fair food by theculinarycapers. Bookmark the permalink. The alcoholic mandarin orange and pineapple smoothie at Andy’s Grill was delightful! Never knew a smoothie could have a fizzy feel. It was perfect for cutting through the grease of the cowboy bites next door. I love sweet with meat, so the big bacon was enjoyable. The experience was kinda marred by the big bite of greasy fat at the end, but what can you do? It’s bacon. The pretzel croissant from French Meadow with honey mustard was awesome. Light, buttery, flaky. Definitely the next step in both pretzels and croissants. And the honey mustard was both sweet and spicy. 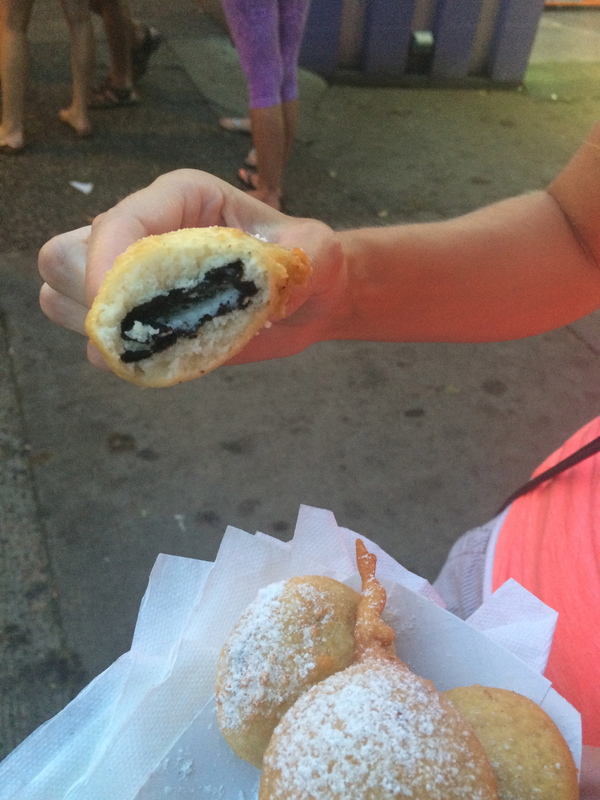 I totally agree about the deep fried Oreos (but I needed 2). Especially fun to stand around and share them with a couple of state fair police officers. 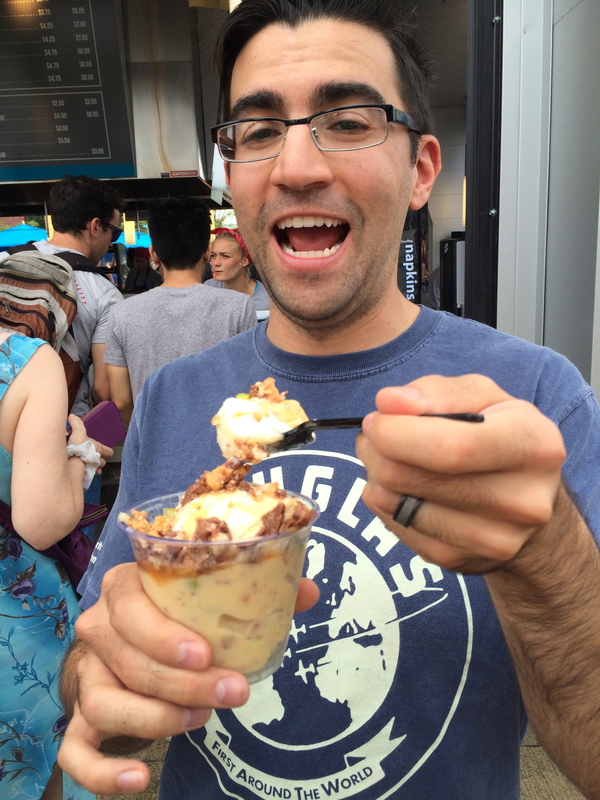 Sweet corn ice cream was…interesting. French fries from the huge French fry booth across from the midway were the epitome of disappointment. The deep fried Buckeyes weren’t as good as I remember. Annual must-haves that never disappoint: mango smoothies from Holy Land Deli and deep fried pumpkin pie with cinnamon ice cream from Minneapple Pie. 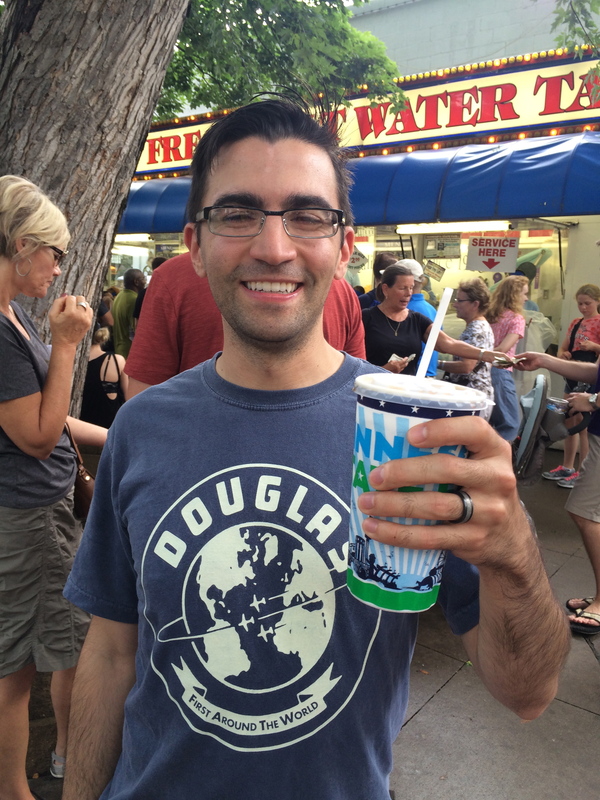 These are the only state fair items I actually crave during the rest of the year.